‘I come from there and I have memories / I have a mother /And a house with many windows…’ wrote one of my favourite poets Mahoud Darwish. Tsering Choden Dhompa came from a place, where the land was so white and cold in the winter you would think a humongous freezer was perpetually at work; in the Summer the same land would transform into a colossal garden as if the goddess of art was letting the entire arsenal of her palette loose on the plateau. This cycle of seasons continued. Yaks pounded flower petals into pulp when the sun was hot or left large imprints in the snow when the wind was cutting into their coats. Choden lived there until she was forced to encroach on others space as a million bayonets poked through her blue sky and snuffed out the yak-dung fire in her hearth. Soon after being wed to the chieftain of a nomadic clan, she hastily packed her belongings. The year was 1959. It took three more years for Choden and her group to escape from Tibet – braving many encounters with Mao’s Red Army, hunger and death. In exile she gave birth to her daughter, Tsering Wangmo Dhompa, in Dharamsala, a small town in northern India. Tsering Wangmo grew up listening to her mother’s stories in their tiny rented rooms – tales of flowers so bright one would turn pale at the sight or the land so cold that pee would turn into a thin stripe of yellowish ice before it hit the ground. At the age of twenty-four, Tsering was left alone with a bunch of hand-written notes and her mother’s recollections enveloping her entire existence. When the heart is over-burdened with memories, and the mind over-stuffed with tales, they often misbehave and worst still rotate out of their orbit. Once an American friend visiting Dharamsala remarked, ‘Tibetan children are so cute with their red cheeks.’ We were sitting on a rooftop restaurant and witnessed a monkey jumping from a tin-roofed house to a tall pine tree. ‘Even the monkeys have red bottoms, so cute!’ she blurted. I didn’t know whether to laugh or to cry. But I am at peace now. You can sigh with relief too. At last, Tsering Wangmo Dhompa has written a book which is at once classic and profound. Tsering has nurtured her mother’s stories in the depth of her heart until they are perfectly ripe and then seasoned them with tales from contemporary explorations. The result is Coming Home To Tibet. This is arguably the first-ever book in English – authored by a Tibetan born and raised in exile – that masterfully weaves a number of narratives into a tale to reflect the multi-layered Tibetan way of life and manifold issues facing Tibet today. Never having read a Tibetan story that is so absorbing and refined, I didn’t realise the punch had landed on my belly until the glove was off the hand. After college in Delhi, Tsering packed her toothbrush and went off to the US to pursue further studies in creative writing. Years later she made a number of visits to her mother’s birthplace in eastern Tibet to confirm the veracity of her mother’s stories which she clung to while moving from one rented place to another. After arriving on the vast landscapes filled with tiny flowers fighting for a space to pop their heads up to the eternal blue sky, Tsering realised her mother’s words were more than matched by the profusion of colours on the ground. Tsering does not push herself to the forefront of the narrative. Her love for the land and its people overshadows her and she becomes secondary. She carefully reconstructs Tibetan life through conversations with her relatives – Aunt Tashi, Uncle Phuntsok and Ashang, and over thirty cousin-brothers and sisters – and anyone else who has a story to tell. Like a veteran detective, she lets nothing go unnoticed. To define her people, their civilisation and the present dilemma under occupation, Tsering has picked up the tiniest scraps of evidence such as the way a young man stands leaning against a newly-installed electric pole in Kegyu, or the obstinate persistence of nomads to stick to their land and animals, no matter how much they are bombarded with ideological indoctrination or propaganda about the benefits of life under the red flag. Tsering has the patience of a hermit when it comes to coaxing tales from the most reticent of informants such as her uncle. After many silent evenings, her uncle tells her of his life and the experiences of over two decades in prison simply for being a lama and the relative of a Tibetan chieftain; how he witnessed as prison guards dragged ‘the dead away like a log of wood down the hallway and disposed them in ditches’; and how he failed to tease even a single drop of tears from his eyes after Mao died when prisoners were ordered to cry or face dire consequences. Very little has changed in Tibet since the terrible campaigns of the early years of China’s occupation. If at all, the scale of repression has increased. Since the 1990s over 2.5 million Tibetan nomads are being forced to settle at permanent locations. This has caused joblessness, social disharmony and most of all the death of over nine thousand years of Tibet’s mobile civilisation. Nomads are governed by decisions made in Beijing. There is, Tsering writes, ‘no place for truth in the system, just the act of allegiance’ to the rulers. Coming Home To Tibet records the lives of Tibetans. And yet it is certainly not a book that simply uncovers Chinese rule on the high plateau. Tsering meditates on exile, dislocation and her ‘transnational nomadic existence’. No matter how much she loves her native land that gave birth to her mother, Tsering cannot brave the harsh winter of the land of snows. Icy wind filters into the layers of her garments and cold floors sends chills through three layers of woollen socks and then sneaks into her flesh and bones, forcing her to book a permanent place near the stove. The winter has only begun. Tsering has to find her way out. The road that brought her into Dhompa – where her grandfather was the chieftain – takes her back to San Francisco, where the electricity is as dependable as a yak. A washing machine, wireless internet, a walk in the park or an occasional cup of coffee has become a part of her life. ‘The city gives one the feeling of being home,’ writes Simone Weil, the French philosopher and mystic. For displaced people around the world, such as Tsering, there is an urgent need to ‘take the feeling of being at home into exile’ and to ‘be rooted in the absence of a place’ temporarily stolen away from them. If anyone who is over-burdened with memories fails to create a provisional ‘home’ in the borrowed land, the pain gnaws from within and life becomes unliveable. Coming Home To Tibet is a fitting tribute from a daughter to her mother. Tsering has narrated her personal loss and the collective loss of her homeland like no one else. In her acquired tongue, she has written a book that is dangerously subtle and evocatively beautiful. We can invoke clouds only in poetry. Reality is too harsh and clouds only return to strange lands. On New Year’s day in 1994, Tsering’s mother died in a tragic car accident on India’s Grand Trunk Road. Choden was with three friends. Words can never fill the void left by the death of a beloved mother or the loss of a country, but they are the only enduring milestones against forgetting. Words assign a place in history for the accused, the persecuted, the occupied and the dead. To forget is not to care and not to care is to collude against memory. It denies truth a chance to triumph. 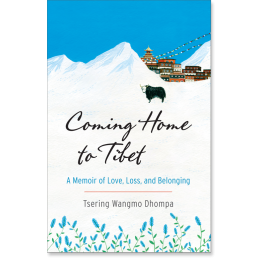 Coming Home To Tibet is a crowning achievement, a quintessential book worthy of the granddaughter of a Khampa chieftain from Dhompa in eastern Tibet. This should and must be read by all Tibetans and their friends for a thoroughly nuanced understanding of Tibetan lives then and now.